Raging Swan Press have got an epic deal for you over at DriveThruRPG. You can get over 200 Raging Swan Press PDFs for only $29.67 – that’s a 95% off the normal retail price of $667! Master the Game. Get it Now! I just made this purchase and my only complaint is that after seeing the list immediate download….. I don’t know when I’m going to have time to read literally -1000’s- of pages of material. I’ve already looked over something immediately useful for my current campaign – the Sunken Temple partial module. Thanks for your support to gaming! I hope you enjoy the books and that you find things worth adding to your campaign! Holy Buckets! Got my email yesterday regarding my +5 Bundle of Gaming Awesomeness, looked at the massive list of stuff, thought about it for about 2 seconds, and snagged it. Now I’m obsessively reading over my 1.5 gigs of insane greatness. Haven’t moved in hours. Creighton, I’ll have you know that 30 days ago I’d never heard of this website . . . but in the last month I’ve made my own Dragon and the Thief board, am currently impatiently waiting on your Dungeon Dressing book to come in the mail, constantly on your website, and probably going to do my first Patreon subscription sometime soon. You’ve basically got the best game website I’ve found in a long, long time. Thanks so much for the kind words, Pat. And in particular thanks so much for plotting joining up to our Patreon campaign. Patreon has transformed the way we work at Raging Swan Press because giving our freelancers decent wages has A) makes me feel really good and B) enabled us to pay a decent pay rate for jolly decent work. Thanks for setting up this deal! I made the purchase and spent some time downloading all of the PDFs from DriveThruRPG. It’s a bit overwhelming to have all of this stuff in front of me, but I’ve become very excited about adding flavor to my in-game locales using these materials. 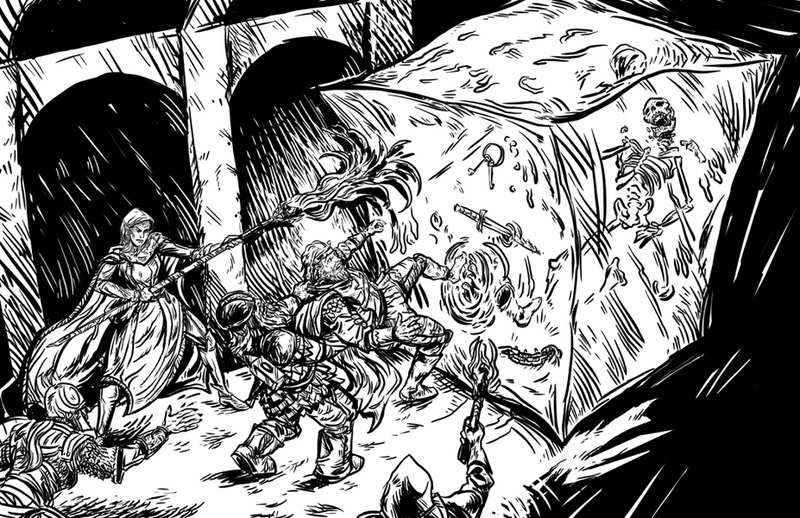 The prospect of creating and running a dungeon crawl suddenly sounds very attractive to me again. And having the 100% Crunch collection takes a massive weight off of my proverbial shoulders. Game on! I’m all hankering after a proper dungeon crawl–you know the kind of thing I mean–loads of levels and loads of rooms; not some small 10-room dungeon but an absolute whopper of a beast! Once my Shattered Star campaign ends, I’m going to run a campaign in Gloamhold. That will be awesome. Your articles are so good on Raging Swan Press that I bought this material. I’m converting it as needed to 5E since I don’t play PF. Thanks for this killer deal.